GALLIPOLIS — The Ariel-Ann Carson Dater Performing Arts Center welcomes Appalachian Music Master Dan Levenson to their summer teaching staff. Levenson has been recognized as a master teacher and performer of the Appalachian Fiddle and Clawhammer Banjo styles of old time music. He has been playing since he was a child and over his career has authored 13 books for Mel Bay Publications, recorded eight CDs, solo and with his band The Boiled Buzzards, as well as toured internationally as a full-time musician. 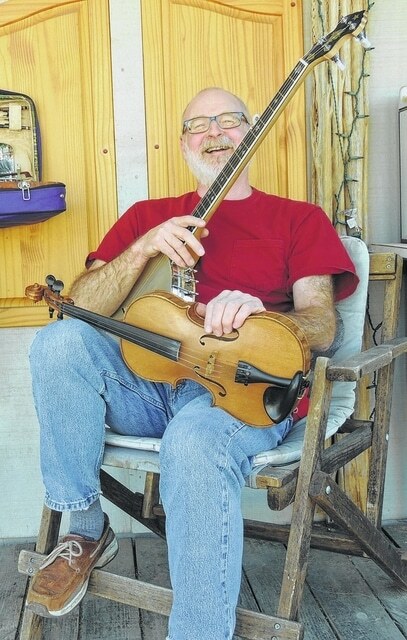 He has won several awards including Ohio’s Clawhammer Banjo Championship and he won first place in the Coshocton Old Time Fiddle contest. Levenson brings his teaching skills to the Ariel each Wednesday this summer for those wishing to learn to play or improve their skills on banjo and fiddle, old-time guitar or even the mandolin. He has several spots open this year. Levenson has made Gallia County his home each summer since 1996 when he purchased an old homestead near Morgan Center. He comes in each year to work on the house, grow his garden and teach students at his homestead. His weekend-long Clawcamp – Clawhammer Banjo workshop is sold out this year as it often has been in the past. Some might consider Levenson Gallia County’s own Appalachian Jorma; others just want to learn to play the banjo. Whichever you choose, contact Levenson at Clawdan@clawdan.com to get started or get better at old-time music. Find out more about Dan by visiting his website, www.clawdan.com. Lessons are available in person or by webcam, i.e. Skype. The Ariel also offers lessons taught by Ohio Valley Symphony violinist Ian Jessee, as well as piano and voice lessons taught by Judy Cavendish, director of the Ariel Childrens Chorus. To set up violin lessons, contact Ian at 304-550-3078. To set up voice or piano lessons or get info on the Ariel Childrens Chorus, contact Judy at 304-550-3078.